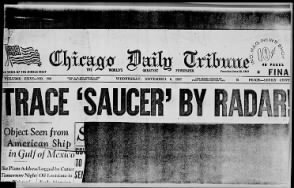 In celebration of Halloween this coming weekend, we thought we would share some spooky, surprising and macabre stories about Edgar Allen Poe, UFO’s, horrific newspaper articles and more that all come from documents found on fold3.com. If you’ve come across any spooky stories in your research, please share them in a comment on this post. This story was found in the The Chicago Tribune on October 30, 1875. 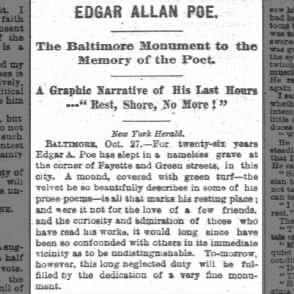 Edgar Allen Poe was found sleeping on a park bench, he was carried to a hospital. His eyes rolled upward into his head so that only whites balls could be seen. He twitched and then died. It was midnight. Here’s a story from the Project Blue Book – UFO Investigations from 1957. Two teenage girls see a glowing egg-shaped object in the sky over Primrose Acres, a suburb of Annapolis, MD. Across the country, others see the same thing including an engineer at White Sands Proving Grounds in New Mexico. The US Air Defense Command says only 1.9 percent of these reported sightings end up in the “unknown” category. 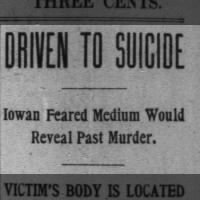 After a spiritualist had promised to reveal the name of a murderer, Mike Nelson—long suspected of killing a wealthy farmer—became alarmed and killed his two daughters and himself. The medium had already stated where the body could be found. Read the front page story in the Washington Post from 1905. Lizzie Borden. What happened to her? Seven years after her parents were hacked to death with an ax in their home, Lizzie Borden takes her $350,000 inheritance (about $9.4 million in 2010 dollars) and moves into a more elegant home just a mile away. Read the follow-up story about her in this Small Town Newspaper in Wyoming. 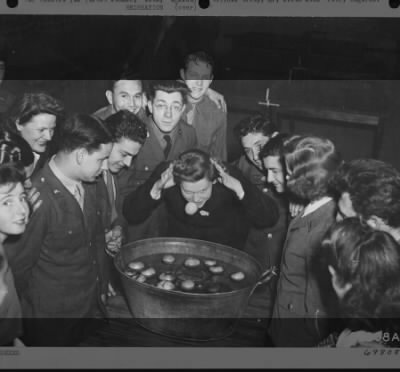 This photo comes from the World War II Air Force Photos. Men of the 70th Service Group, based at Essex, England, duck for apples at the Halloween party sponsored by the Aero Red Cross Club on October 29, 1943.